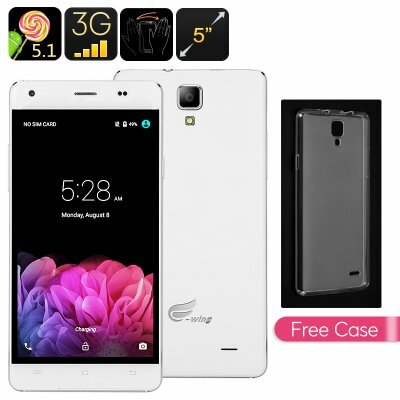 Successfully Added Ewing E8 Android 5.1 Smartphone - Android 5.1, Quad Core CPU, 5 Inch Screen, Mali GPU, 720P, Smart Wake (White) to your Shopping Cart. The Ewing E8 is a remarkable budget phone that offers a great user experience. This no-nonsense Smartphone has been equipped with all the basic needs of a modern cell phone yet comes with an exceptionally low price tag. Perfect for kids, first time Smartphone users, or elderly who do not need all the excessive and highly priced features of a high-end Smartphone. It’s 5 Inch HD screen has been placed within a stylish and smooth metal frame, giving the E8 a classy look. With Google Play installed this 5 Inch Budget Smartphone offers you the perfect means to enjoy all your favorite movies, games, and Apps in their full glory. Backed up with a removable 2200mAh battery the E8 lets you enjoy up to 8 hours of continuous usage – enough to see through the most hectic of days without the need to be recharged. Featuring a Quad-Core 1.3GHz MediaTek CPU and 1GB of RAM the Ewing E8 has all the power the average Smartphone needs to support your daily multi-tasking activities. Its Android 5.1 Operating System is furthermore guaranteed to deliver a smooth user experience that is capable of meeting all your demands. With its 2 SIM car slots and dual IMEI number this budget Smartphone offers you the possibility to connect to two networks at once – ensuring you to have a wider area of supported usage. This also brings along the ability to use two separate phone numbers with the same device, great for keeping work and private life organized. Its smart wake and gesture sensing features further enhance your user experience as now you can simply open any app straight from your locked screen and navigate through them without the actual need of touching your display. Equipped with front and rear cameras the Ewing E8 offers you the possibility to capture all your favorite memories in great quality. And With the possibility to store up to 32GB of external data you no longer have to worry about running out of storage space ever again.